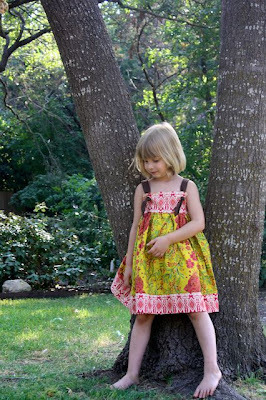 After finishing this dress for Indigo, I wasn't so sure I was crazy about the apron. I had a vision when picking out the fabrics and sometimes that vision doesn't play out quite right in reality. As it turned out, Indigo wasn't so crazy about it either. In fact, she told me she didn't want to wear the dress because she didn't like the apron. Now normally that kind of statement would likely lead to a conversation about being grateful for what we have or some other kind of discussion along those lines, possibly sprinkled with an empty threat about giving said dress to a little girl who might appreciate it. :) But in this particular case, I had to agree with her. One thing I've learned about sewing is that it's always worth the extra effort to make something exactly as you'd like it. Because if you don't like it, it won't get worn. Sewing is a labor of love and we want what we make to be loved and worn. So I did a little seam ripping and altered her apron dress, now sans apron. The dress is a hit. I'm happy, Indi's happy and Evie even wanted to wear it. I put it on Evie and I asked if she wanted me to make one for her. She nodded with an empathic "YES!". 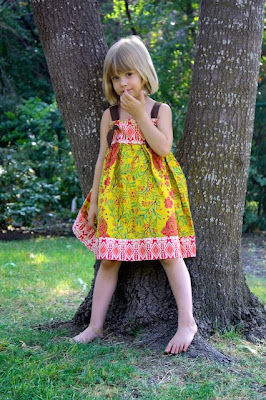 I'll confess, after making one dress, I don't always want to turn around and make another in the same pattern. Evie has many dresses handed down from Indigo. I didn't think she was quite old enough to really appreciate mama-made just yet. But it's their enthusiasm that makes sewing for them so fun. One thing is for certain - our next baby girl is sure to have a lot of dresses! I wonder how long it will be before I'm asked to sew three?! love it much better without the apron too. I don't think it was a fabric pattern issue, just personal taste! I love my seam ripper! Ans yes, I am already getting the "I want a dress like that too" around here from the girls! !